The Crude Art Society was founded in 1978 for the purpose of providing original works of art at an inexpensive price, in line with modern marketing procedures. Our range currently includes paintings and prints, all of which are hand-produced by our own artists, and are accompanied by a certificate of authenticity. Crude Art fills the gap between the mass-produced, cheap, but superficial works currently found in many department stores, and the more searching, but elitist and costly, ‘gallery’ type of art. We aim to provide for the appreciator of art who would like to own original contemporary work, but finds his requirements can be met by neither of these two sources. 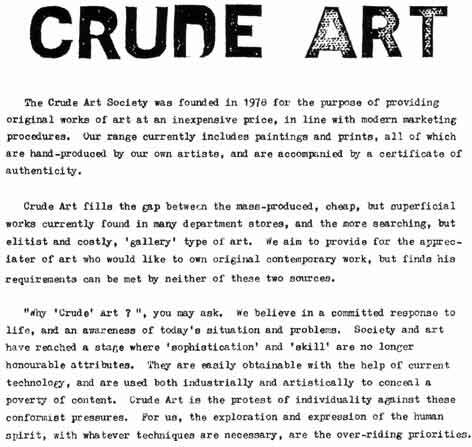 “Why ‘Crude’ Art ? “, you may ask. We believe in a committed response to life, and an awareness of today’s situation and problems. Society and art have reached a stage where ‘sophistication’ and ‘skill’ are no longer honourable attributes. They are easily obtainable with the help of current technology, and are used both industrially and artistically to conceal a poverty of content. Crude Art is the protest of individuality against these conformist pressures. For us, the exploration and expression of the human spirit, with whatever techniques are necessary, are the over-riding priorities.